Batman forever takes place in Gotham City. Gotham has a lot of terror in it. This time Batman comes in contact with two evil men both out for revenge. Two Face is a crazed man with half his face scared due to an incident in the court rooms. See, Two Face, or Harvey Dent, used to be the district attorney before his accident and he blames Batman for this tragedy. Harvey will not stop raining terror down on Gotham until the Batman takes his last breath. Then we have bad guy number two, The Riddler. The Riddler, also known as Edward Nigma, is a scientist that works for Bruce Wayne. Mr. Nigma idolizes Mr. Wayne and when Edward pitches an idea to Bruce for an invention and Bruce turns it down, Edward flipped. His invention involved mind control and that's why it got rejected. Turns out in the long run Bruce made the right choice. The Riddler and Two Face team up to not only cause as much chaos in Gotham as possible, but Edward continued with his project. In a matter of no time Two Face and The Riddler were out of control, and all of Gotham was eating out of their hands. Not knowing these two men have been the ones tearing the city to shreds and controlling their minds. This dynamic duo of destruction thought they were on top, little did they know Batman had a sidekick waiting in the wings. Robin is an orphan who is out to get Two Face for killing his family, and after finding out the Bruce was batman, he forced his way as Batman’s sidekick to find Two Face and seek revenge for his family. Batman Forever has action, romance and comedy all in one with a well renowned cast. It has that dark scene you’d expect of Tim Burton, and all the action you’d expect for Batman. Excitement from begining to end. 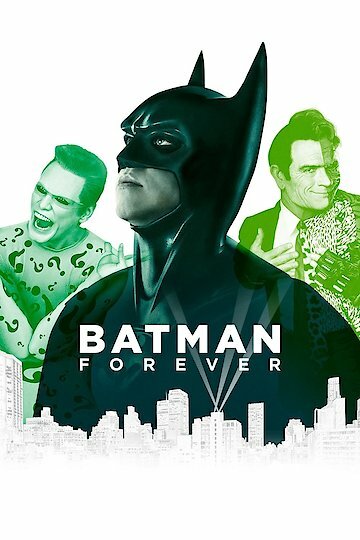 Batman Forever is currently available to watch and stream, download, buy on demand at DC Universe, Amazon, Vudu, Google Play, FandangoNow, iTunes, YouTube VOD online.